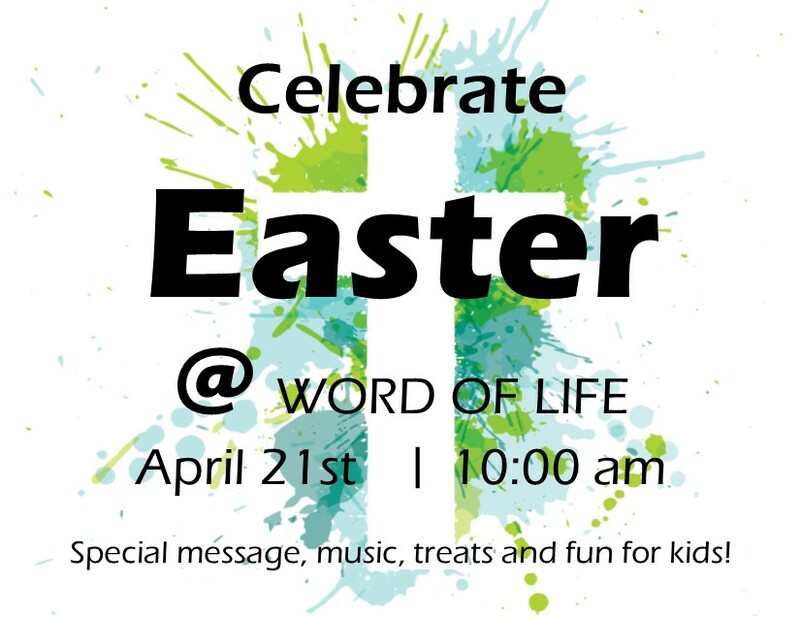 Everyone is invited to come to Word of Life Church on Easter Sunday at 10 am for an Easter Celebration. 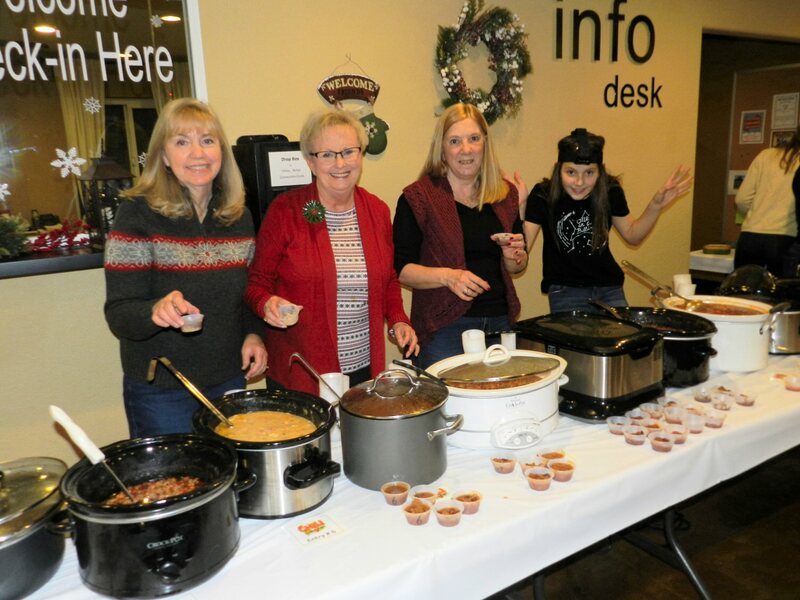 Starry Nights + Chili Cook-off = A Wonderful Holiday Feast! 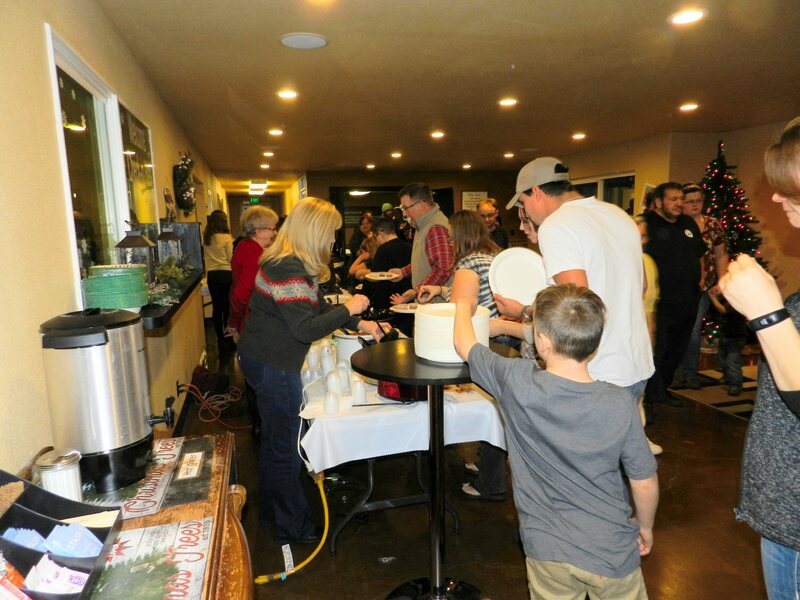 By 6 p.m. people were streaming into the Word of Life Assembly of God (WOLA) for the combined chili cook-off and Starry Nights Christmas music program. 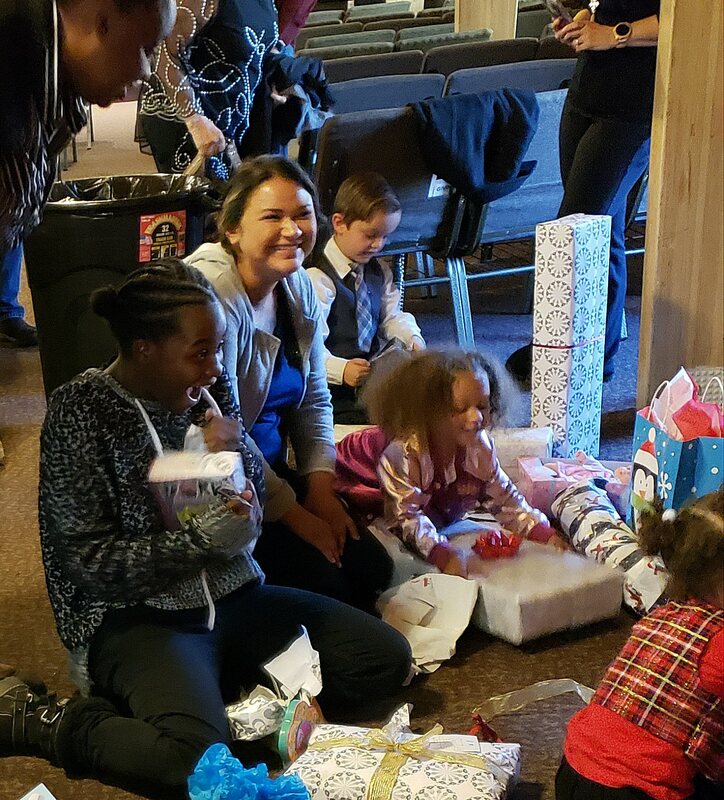 WOLA’s motto is “Loving God and Loving People.” This annual Christmas program, open to everyone in the public, is one of the ways in which they share their love and gratitude with the community. Before long the beautifully decorated worship hall was filled with more than 150 guests. Meanwhile in the foyer, WOLA volunteers were prepared to serve samples of seventeen chilis that had been entered for the cook-off. Pastor Ken Frazier welcomed everyone and explained directions for the cook-off. People would line up to receive seventeen samples of chili in numbered cups. After sampling them they could vote for their favorite and also go back to enjoy a full bowl of their favorite. “This is one occasion when you are allowed to judge,” he said. People filed through the foyer filling their plates. 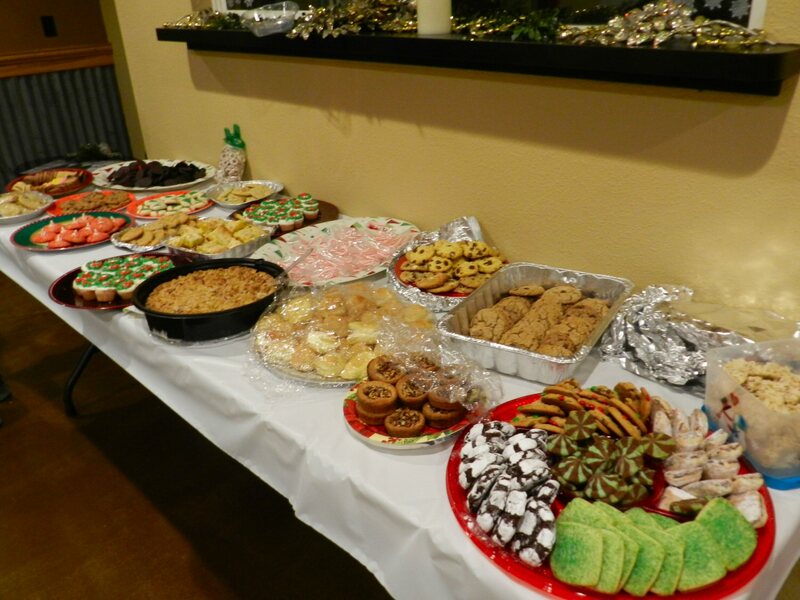 In addition to chili, there were corn bread, condiments, clam chowder, and lots of goodies. 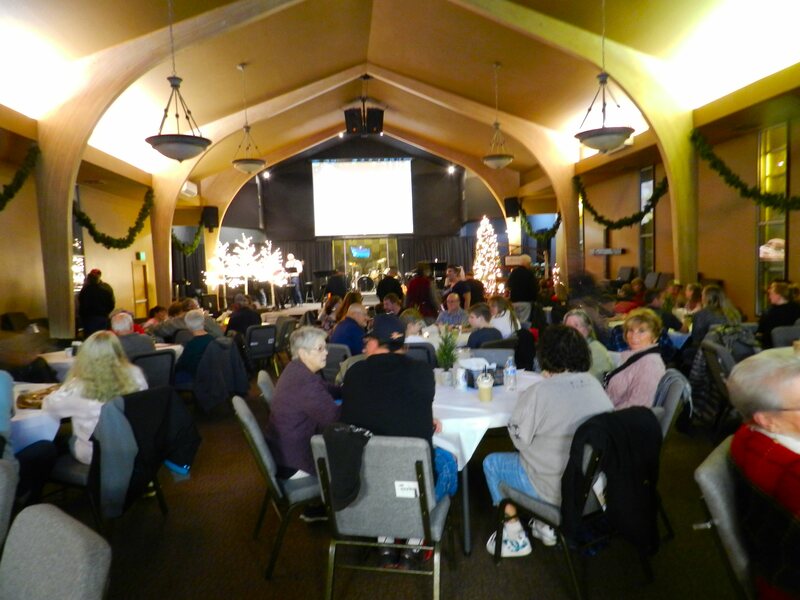 People enjoyed the food and fellowship. Singers and musicians came forward to lead the audience in a joyful heartfelt mixture of traditional and contemporary Christmas songs. 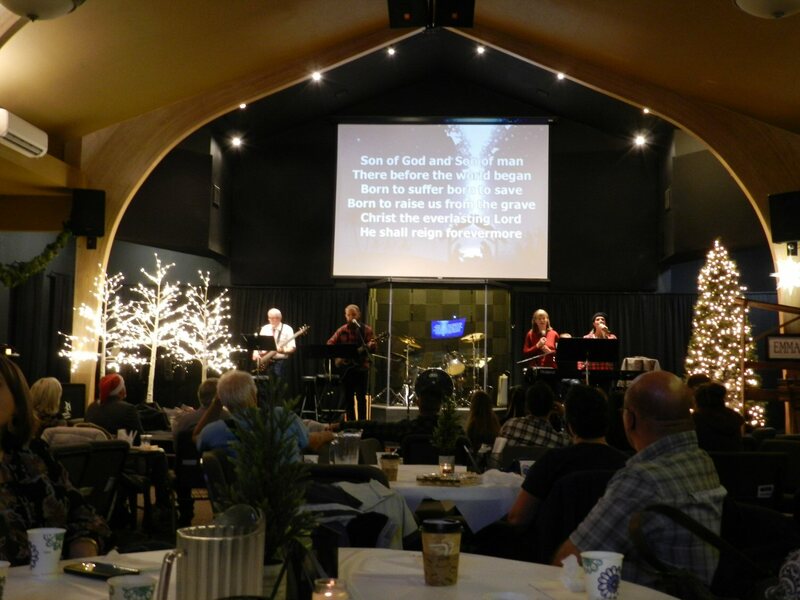 As the food filled the bellies of the diners and the music filled the air, the Holy Spirit filled the hearts of the people with God’s love and inspiration. Pastor Ken came forward and announced a short intermission in the music. He was ready to announce the winners for the chili cook-off. Third place went to Shasta Bellagante. Matt Swanson won the prize for second place. 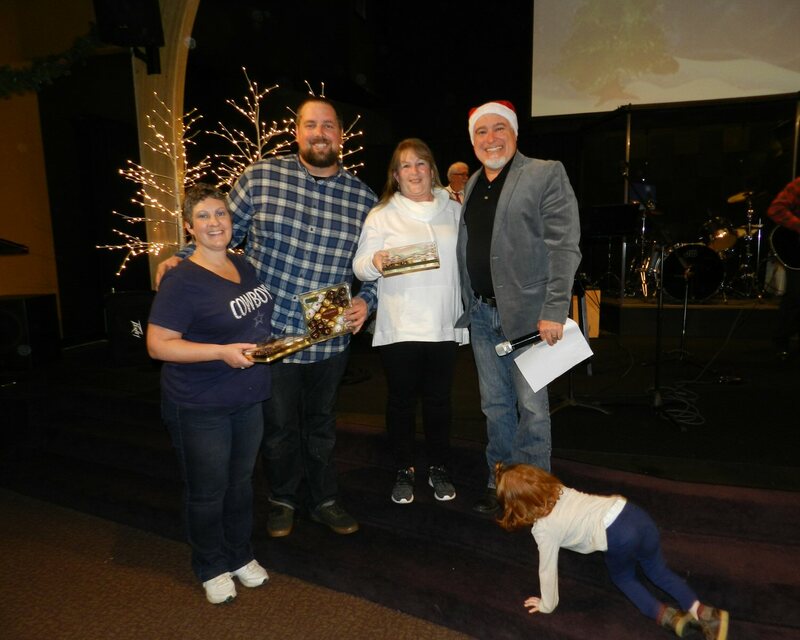 And the winner of the Best Chili for 2018 was Kimbra Biles! Then Pastor Ken asked Alex and Linda Colvin to please come to the front of the room. Like faithful sheep, they followed the pastor’s voice and came forward. 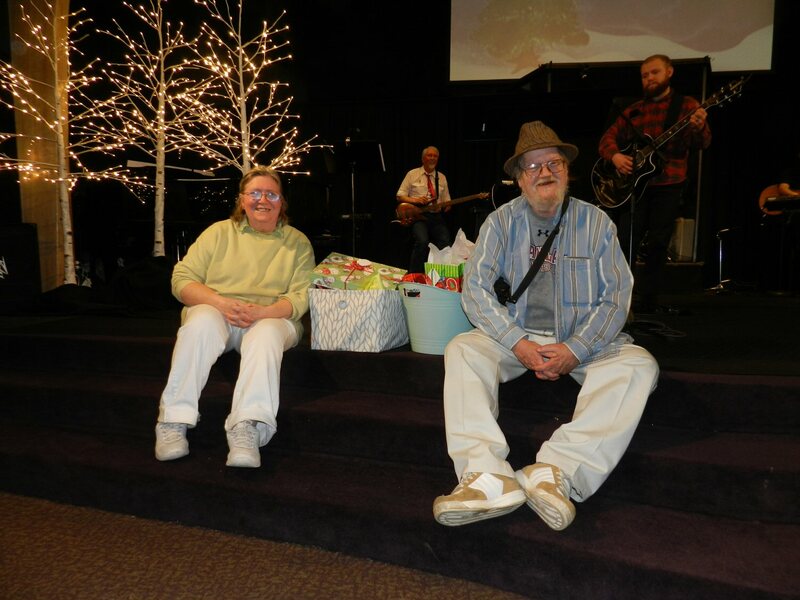 Ken announced that people in the church had decided to provide a special surprise Christmas blessing to this couple – two large baskets filled with gifts. Loving God and loving one another. 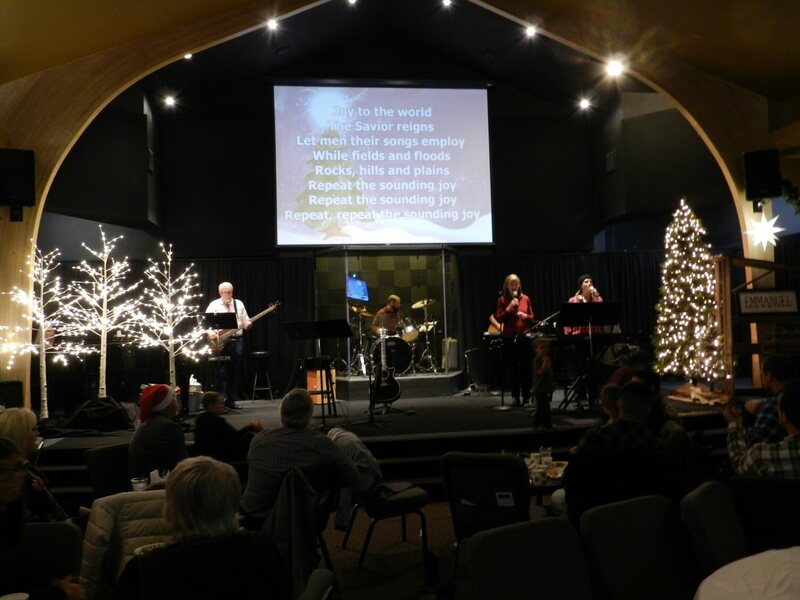 Sharing food, fellowship, and sacred song at a feast celebrating the birth of Jesus, the Son of God and Holy Messiah. Is this not a taste of the Kingdom of Heaven on Earth? 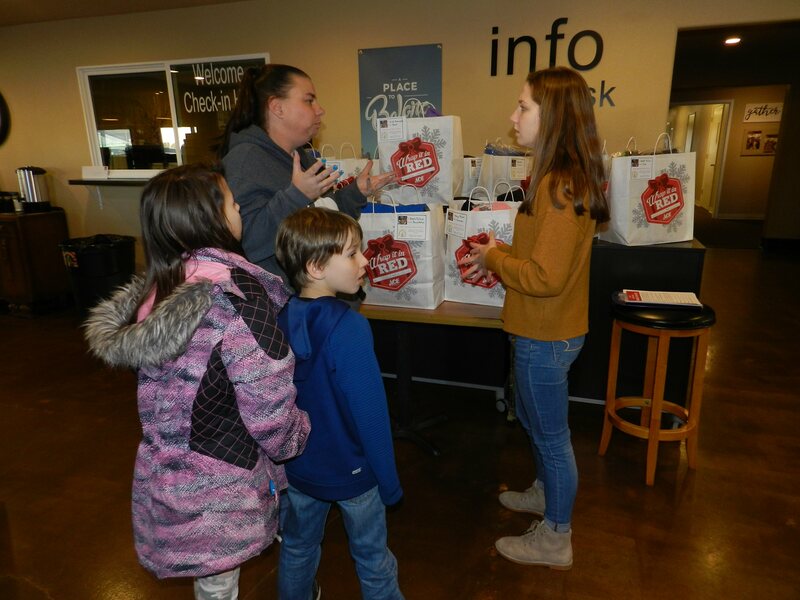 Operation Warm Winter provided new warm coats and boots to more than a dozen elementary school children at the GIVEAWAY at Word of Life Assembly of God Church (WOLA) on Thursday afternoon between 3-5 p.m. More families came to the program on Thursday to sign up. They will also receive boots and coats in the near future. 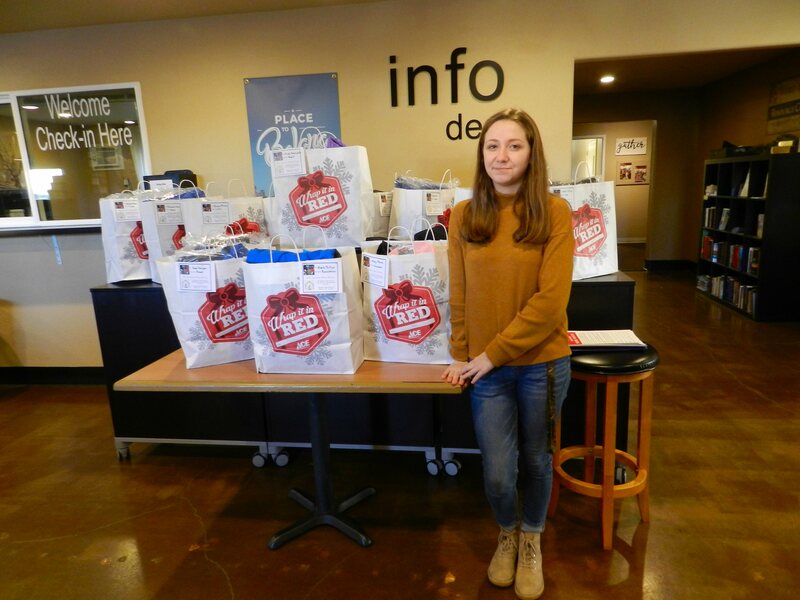 Burney High School Junior Kira Hernandez organized Operation Warm Winter as her Senior Project. Burney Elementary School teachers assisted in selecting 15 children who needed warm coats and boots. Parents signed up in advance so that the exact size needed could be purchased. The program is funded by community donations. A major fundraiser for the program the past few years has been the concert by the Ohio Northern University Choir held in the late Spring. 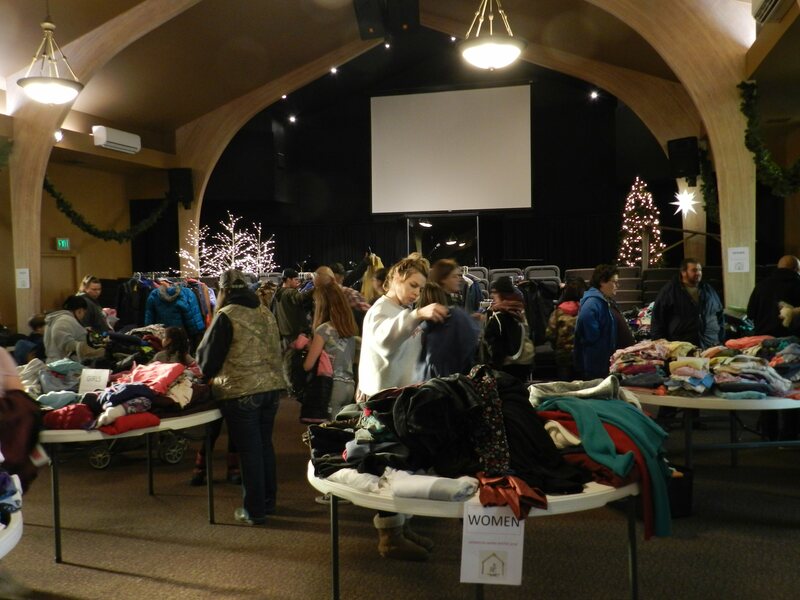 In addition, scores of people from the community came to select coats, sweaters, sweat shirts, pants, shirts, and other gently used items that had been donated by people from the community. Altogether, over 200 people signed in for the GIVEAWAY. WOLA church secretary Kathy Newton helped Ms. Hernandez to organize the GIVEAWAY at the church. 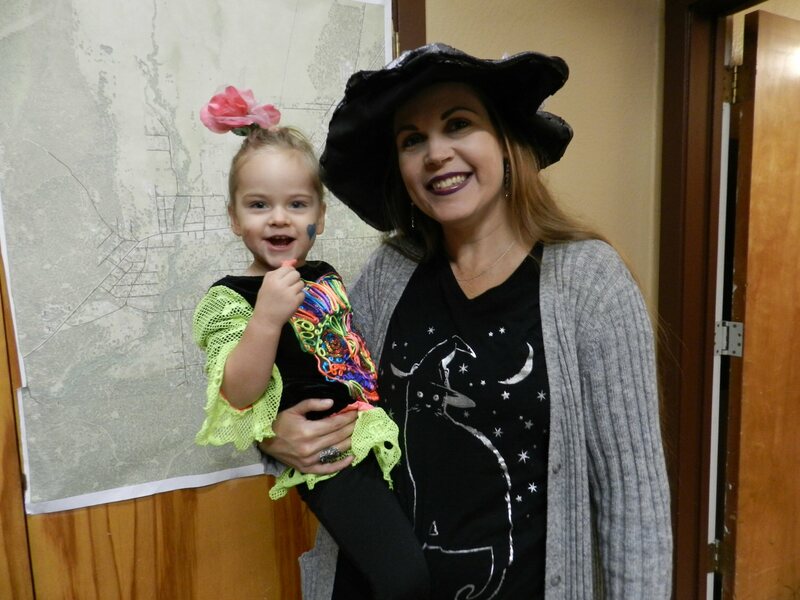 She also helped with fundraising and collecting clothing donations. The Burney High School Leadership Club came in the morning to help set up tables and display clothing. Volunteers helped to man the sign-up tables and oversee the event. Pastor Ken Frazier was present to welcome and chat with all who came. Operation Warm Winter was started in 2007 when Stephanie Pruitt, a WOLA church member and wife of a BHS teacher, discovered that some elementary school children could not go outside to play during recess in the winter because they did not have adequate winter clothing. Ms. Pruitt ran the program for six years. Parents and community members interested in learning more about the program can contact Burney Elementary School or Kathy Newton at WOLA. For the last two years, a Burney High School student has organized the program for their Senior Project. Last year junior Alexus Bellino organized the program. This year Kira Hernandez has successfully overseen the operation. 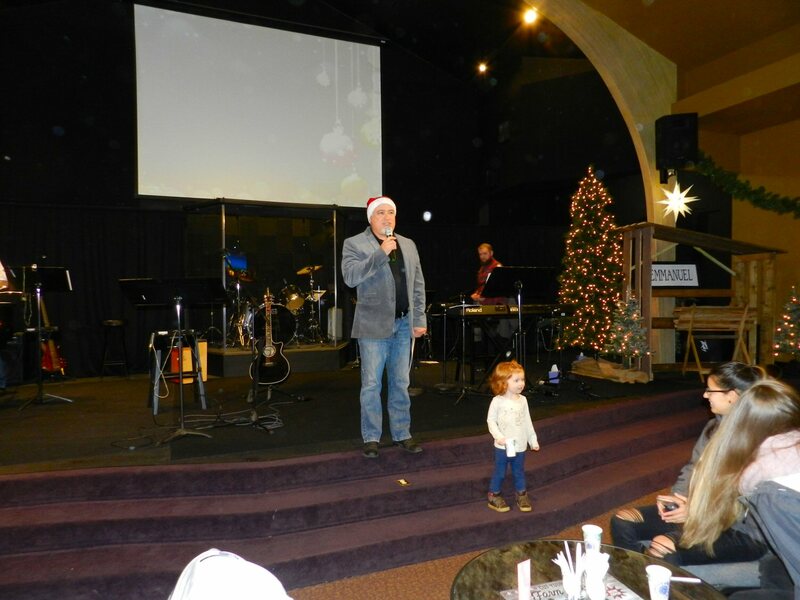 Approximately 45 people attended a “Christmas in November” program at the Word of Life Assembly of God Church (WOLA)in Burney on Saturday, November 10 to support Happy Valley Women & Children’s Center in Anderson. Happy Valley Women & Children’s Center is a part of Sacramento Valley Teen Challenge, a branch of Adult & Teen Challenge, a worldwide network of Christian faith-based corporations intended to help teenagers, adults, and families with problems such as substance abuse or self-destructive behavior. Eight churches from the Assemblies of God Mt. Shasta Section of the Northern California Nevada District participated in Saturday’s gathering at WOLA . $50 gift certificates were given for 23 women and gifts were given to 6 children. Each child received a present purchased specially for them. 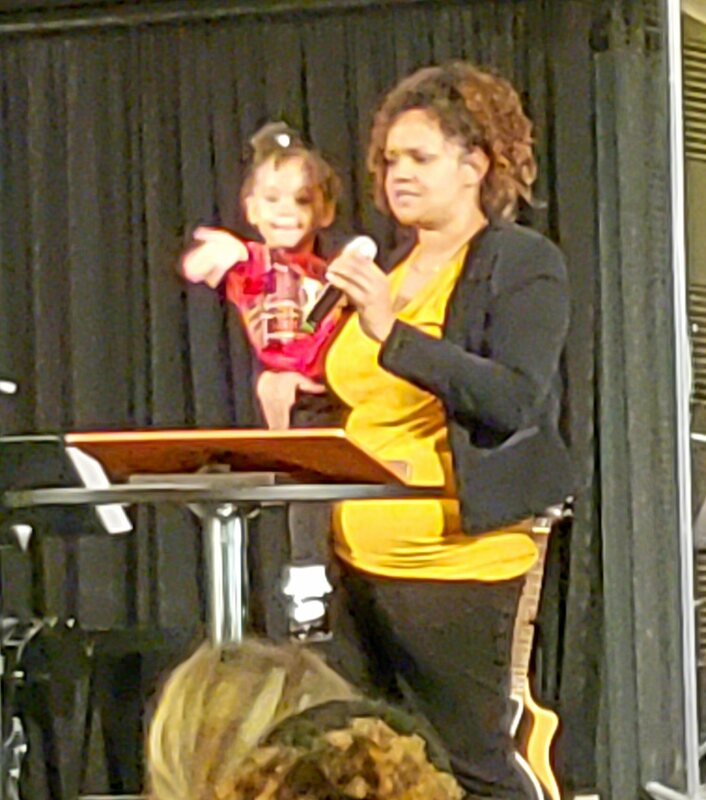 The event included fellowship, testimonies from women participating in the Happy Valley program, and lunch. Anna’s Country Kitchen donated beef enchiladas to provide a delicious main course. Teen Challenge traces its roots to the work of David Wilkerson with New York City teens in the late 1950’s. Wilkerson founded Teen Challenge in 1960. In 1962, he published his influential book, The Cross and the Switchblade. Over the years the program expanded nationally and then internationally. It also expanded its work to include families and adults. In 2017, the organization officially changed its name to Adult & Teen Challenge to acknowledge that the organization works with both teenagers and adults in its addiction treatment centers. For the past ten years, Operation Warm Winter, a community service ministry of Word of Life Assembly of God (WOLA), has been providing quality new winter coats and boots to disadvantaged elementary school children. 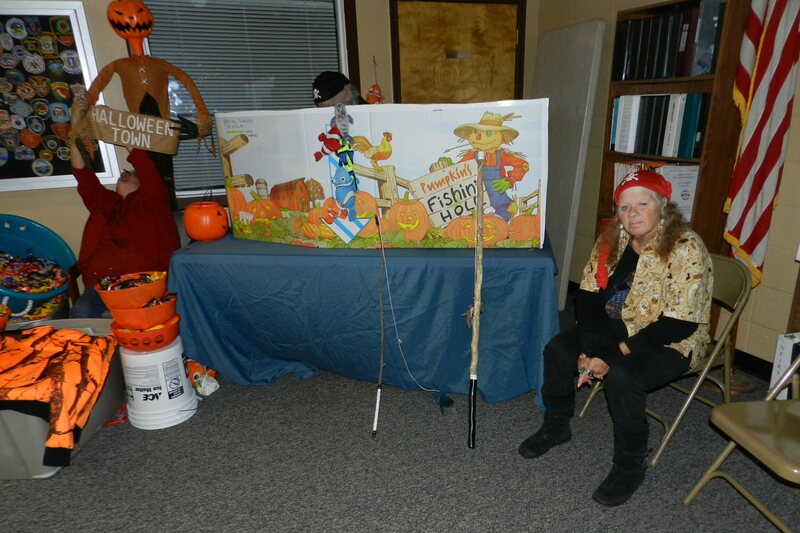 In addition, at an annual GIVEAWAY, people in need can come for gently worn hats, gloves, jackets, and blankets. This year’s Operation Warm Winter GIVEAWAY will be Thursday, December 6 at the WOLA gym located at 37341 Main Street in Burney. 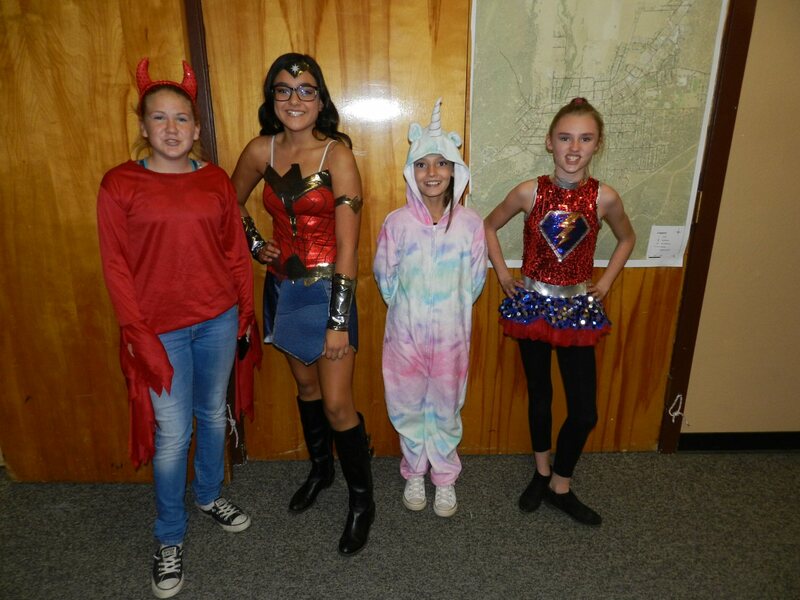 The program was initiated in 2007 by Stephanie Pruitt when she found out that some children in the Burney schools could not go outside for recess because they did not have warm winter coats or boots. Last year, 76 children received new coats and boots. 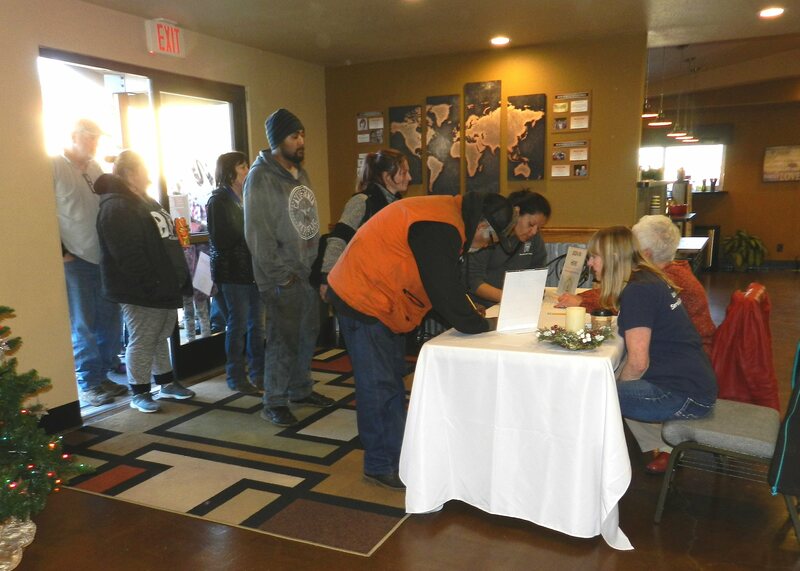 In addition, 86 people came for the annual GIVEAWAY for winter clothing. This year, Burney High School student Kira Hernandez is working to organize the program for her Senior Project. Ms. Hernandez is working together with WOLA Secretary Kathy Newton. Burney Elementary School helps to identify children and notify parents to sign up in advance so that Operation Warm Winter can purchase jackets and boots to suit individual needs. The purchase of the jackets and boots is made possible by donations from church members and the community. A major fundraiser for the program the past few years has been the Ohio Northern University Choir concert held in the late Spring. The winter clothing for the GIVEAWAY is also donated by members of the community. Ms. Hernandez is setting up collection boxes around town for people to donate clean gently used items. People in the community who would like to participate by donating clothing or funds or who would like more information about the program, please call 530-335-4419. 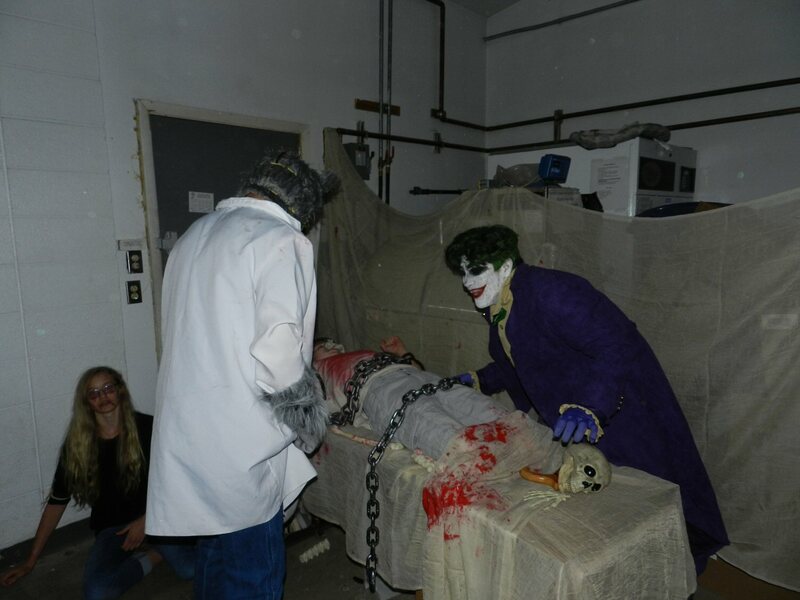 Burney Fire District hosted its 2nd Annual Haunted House on Halloween night Wednesday, October 31 from 6-9 p.m. The front room was full of fun and games for the kids. 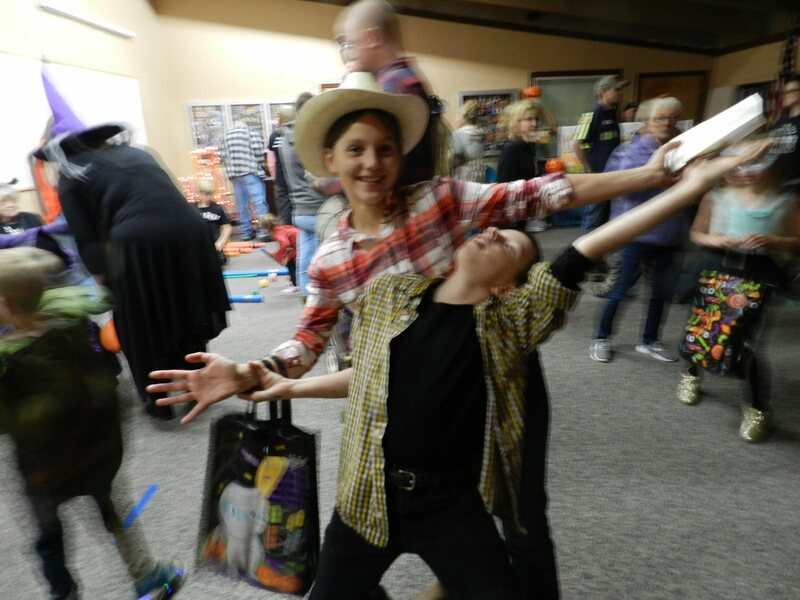 Passing through the haunted house was pretty scary. 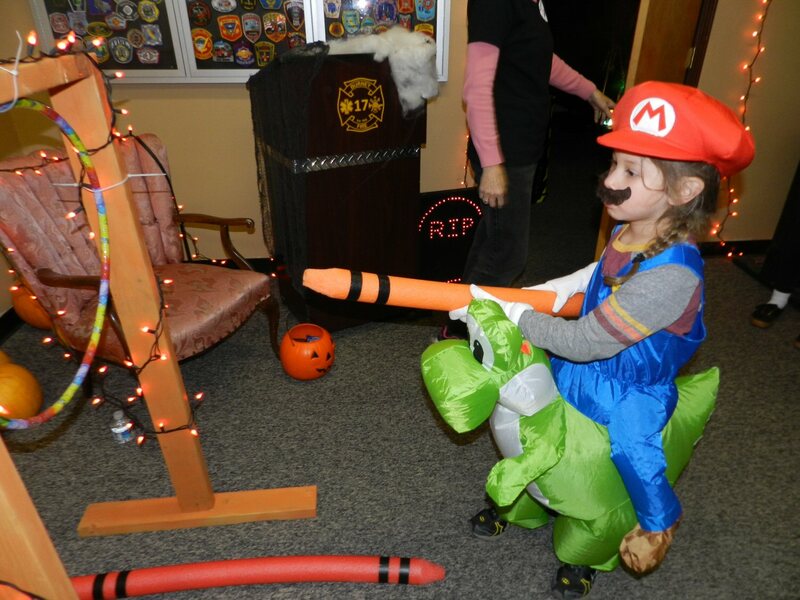 There was lots of candy for the kids and popcorn, hot chocolate, and cupcakes served by Fire District personnel. 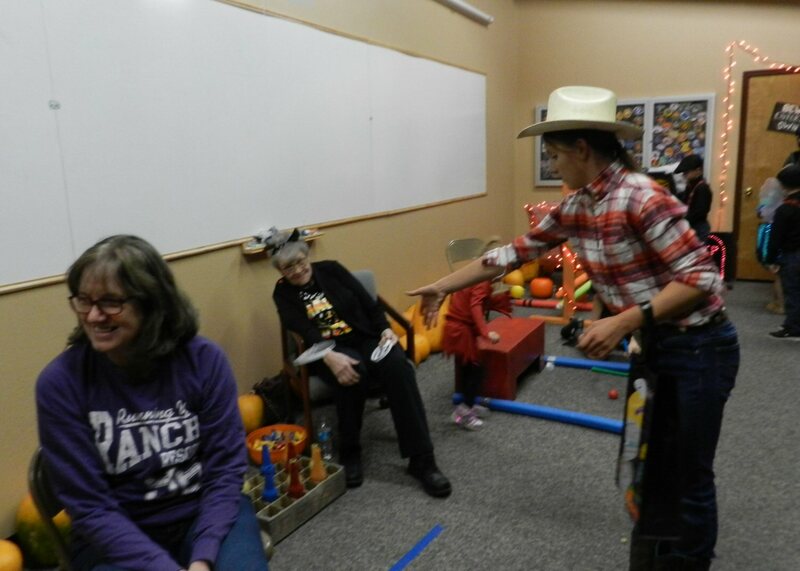 All in all, young and old had an exciting time. Word of Life Church, High Country Real Estate, Citizens Volunteer Patrol, Burney-Fall River Rotary, Mountain Valley Health Center, Rex Club, Interact Club, Anna’s Country Kitchen, and Sickler Electric all pitched in to cosponsor the event and lots of people from the community came to volunteer to make this a fun and safe event. 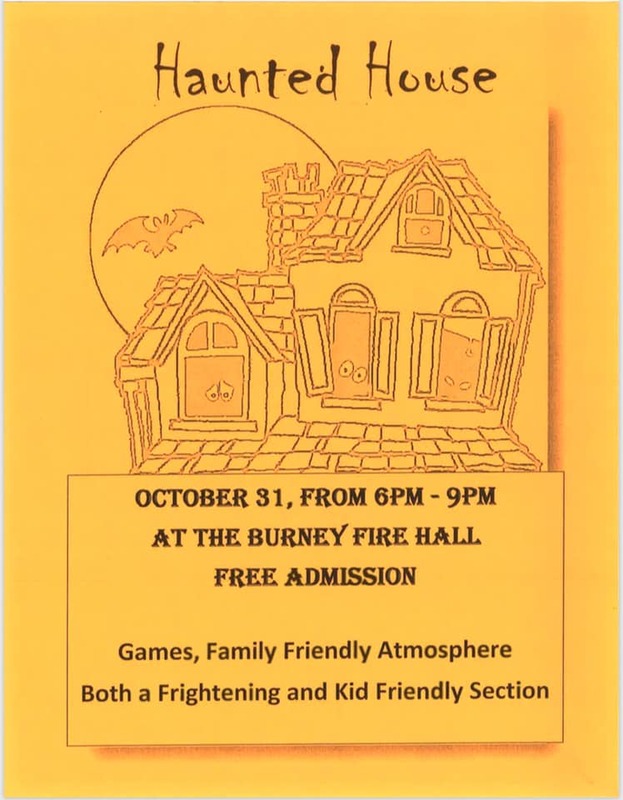 Burney Fire District will be hosting its 2nd Annual Haunted House on Halloween night Wednesday, October 31 from 6-9 p.m. 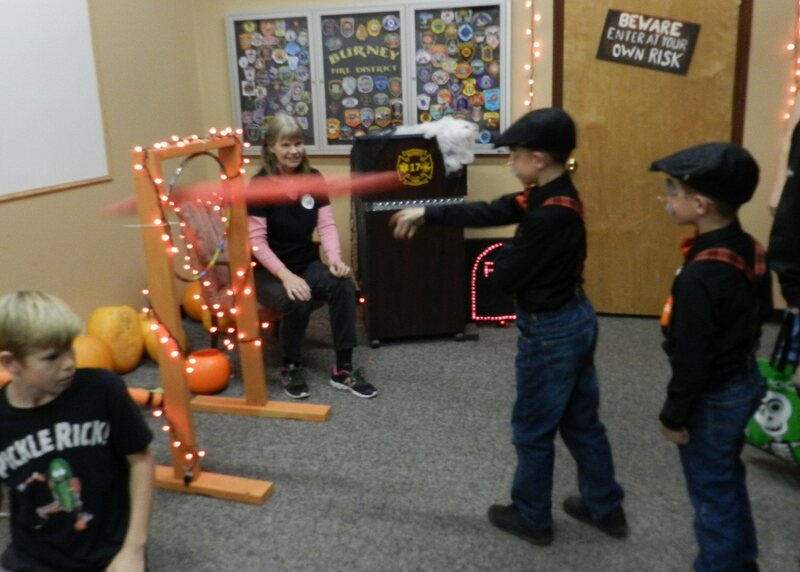 This is a fun and safe place for kids of all ages to come for the candy and games. 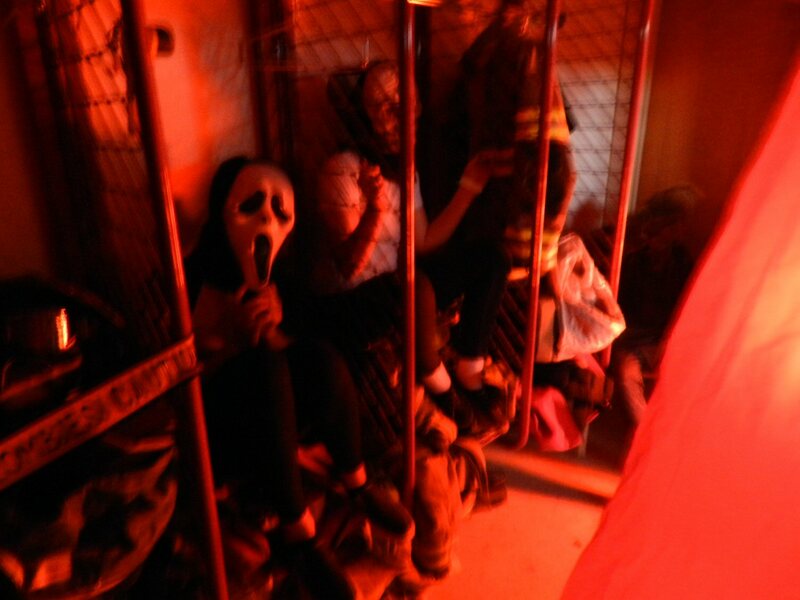 If you’re daring enough, travel through the frightening section of the Haunted House. BFD gives thanks to all the volunteers, local businesses, and organizations who are helping to make this an amazing event including Word of Life Church, High Country Real Estate, Citizens Volunteer Patrol, Burney-Fall River Rotary, Mountain Valley Health Center, Rex Club, Interact Club, Anna’s Country Kitchen, and Sickler Electric.